This project was created on 03/25/2019 and last updated 16 days ago. 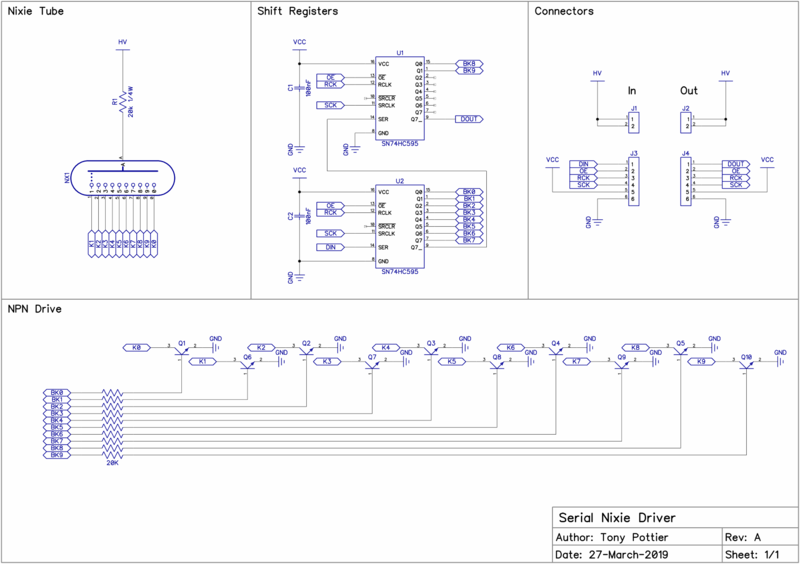 What is Serial Nixie Driver? Serial Nixie Driver is a board roughly the size of a IN-12 soviet era nixie tube that can be driven using a serial interface, hence the name. The serial interface itself is compatible with hardware SPI, but software bit-banging can also be used. The boards can be daisy-chained to create nixie tube chains of any size. At the heart of the driver lies two 74HC595 shift registers providing the serial to parallel interface. Each pin controls a high voltage transistor (MMBTA42) that is able to fully drive the nixie pin without having to resort to voltage clamps. The chosen logic family (HC "High Speed CMOS") means that Serial Nixie Driver is compatible with both 3.3 and 5V logic at up to 25Mhz. Additionally, the "Output Enable" pin is exposed so that you can by default pull-it up to VCC so that the nixies are disabled until you have sent valid data to them. By default, you can ground the pin so that the drivers are always on. The driver requires a 170 to 180V high voltage DC source. A 20K anode resistor is place on each nixie. As a result, the tubes will run at 1mA with 170V and 1.5mA with 180V. Technically, you could run 200VDC but that means the tube will run at their absolute maximum limit (2.5mA) and you risk frying them. You are about to report the project "Serial Nixie Driver", please tell us the reason.